While the election season in the states gets nasty and mean, it’s just annoying in Thailand. 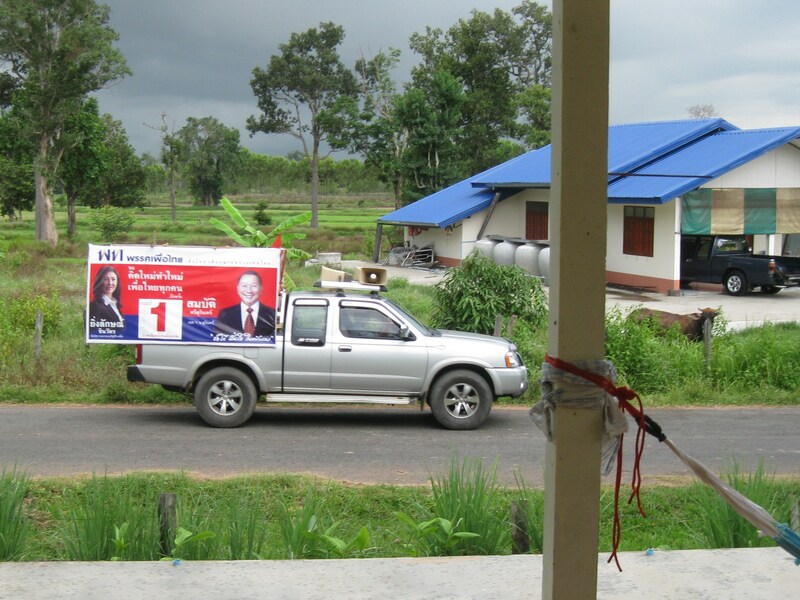 Local elections are being held July 3 and every politician is advertising. They advertise with signs similar to what we see in the states as well as trucks with loudspeakers that drive through villages blaring music and/or a recorded message about the candidate. The trucks are normally covered with posters of the candidate. They start their rounds at 6:30 a.m. every day. From what I can comprehend, Thai politics isn’t as nasty as American. The candidates seem to be promoting themselves instead of putting down the competition. Of course, I don’t watch Thai TV or read the papers, so I could be wrong. The Thai equivalent of a bumper sticker. This makes me wonder how the Thais are choosing who to vote for. I would like to think the trucks aren’t affecting their decision, but I also like to think TV ads in the states shouldn’t affect voters, but they seem to. Why would you trust the opinion of the candidate? Of course he/she’s going to say they’re a better candidate than the competition. Of course the Chevy salesman is going to say the Lumina is better than the Taurus. Of course the stoned Deadhead is going to say Workingman’s Dead is the greatest album in rock history. Why are we trusting these biased opinions? According to John McCain ads, Barack Obama was practically going to hand over the United States government to al-Qaeda upon inauguration. According to John Kerry’s ads, George Bush was going to continue a worthless war in Iraq. Why do these hopeful politicians keep sending their trucks out to the villages? Let’s educate ourselves! That pretty waitress is flirting with you for a tip, not because she likes you. Chuck Berry just showed you where the lady’s room is for a reason. John Edwards wants your vote and nothing more (possibly your wife and/or daughter). The elections are July 3. I honestly have no preference who wins and loses as I don’t know what they’re positions are. Should Michelle Bachmann win the 2012 presidential election, I’m not coming home. I’m not coming home because Thailand is so wonderful, not because America has become a fascist regime. This entry was posted in Peace Corps and tagged elections, john edwards, karl rove, michelle bachmann, politics, thailand by Jeff Jackson. Bookmark the permalink.